Travelers who want to see the amazing natural wonders of the Cerro Verde National Park must first drive northwest to Santa Ana, and then southwest to the Park. This is easily accomplished with our El Salvador GPS map and your Garmin. After arriving at the Park, the main attractions are the three volcanoes with dominate the landscape. The first is Cerro Verde or Cuntetepeque in Nahuatl, a dormant volcano filled with lush vegetation. The road to the park entrance brings you to the summit where there is a small zip line, a local eatery and some snack stands, a exclusive hotel now in ruins which you can tour and see Izalco from the patio and childrens playgrounds. is now closed). Visitors can climb the peak with guidance from police and guides organized at the Cerro Verde main park buildings. Buses are available to/from Santa Ana on a daily basis. The third volcano is Santa Ana, the tallest volcano in El Salvador at 2,381 meters above sea level. Hiking to the crater lake is an amazing trek through jungle and volcanic alpine terrain. The summit contains 4 calderas with a lake in the center which you can see boiling water on occasion. It is a 4 hour round trip hike from the Cerro Verde parking lot accompanied by knowledgeable guides and police officers. You will rarely see a more majestic view than from the tops of these volcanoes. 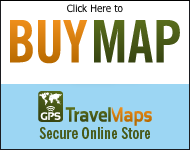 Book your trip and grab our map today! Learn more about El Salvador, including other Top Destinations, Major Cities, hotels, and restaurants in our El Salvador Travel Guide. Screen Capture of our El Salvador GPS Map.